Softie Brown Bear is hand made in the finest dark brown cuddly soft plush and wears his Stainless steel Steiff Button in Ear along with his yellow tag. Softy brown bear stands 25 cm tall. He is dark brown, creating a nice contrast with the soles, face and inner ears. His tiny tail nub is dark brown. His corners of the eyes, the edge of his nose and his mouth are beautifully painted. He has a cute black nose. 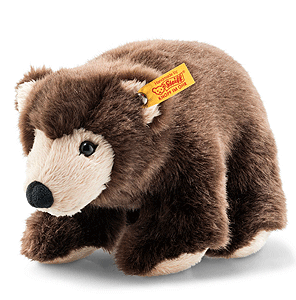 No child's bedroom is complete without Softy brown bear.